Chang-rae Lee, the bestselling and award-winning author of Native Speaker, A Gesture Life, and Aloft returns with his most ambitious novel yet-a spellbinding story of how love and war echo through an entire lifetime. June Han was orphaned as a girl by the Korean War. Hector Brennan was a young GI who fled the petty tragedies of his small town to serve his country. When the war ended, their lives collided at a Korean orphanage, where they vied for the attention of Sylvie Tanner, a beautiful yet deeply damaged missionary. As Lee masterfully unfurls the stunning story of June, Hector, and Sylvie, he weaves a profound meditation on the nature of heroism and sacrifice, the power of love, and the possibilities for mercy, salvation, and surrendering oneself to another. Chang-rae Lee is the author of Native Speaker, winner of the Hemingway Foundation/PEN Award for first fiction, A Gesture Life, and Aloft. Selected by The New Yorker as one of the twenty best writers under forty, Chang-rae Lee teaches writing at Princeton University. "[The Surrendered] is epic in scope, masterful in execution, heart stopping at times, and heartbreaking at others. The meticulous narrative unfolds over 52 years and across three continents. Nothing is rushed; nothing is overlooked. We can even feel the buzz of a window pane on our fingertips as rumbling Japanese military vehicles approach along a gravel road...Lee understands that in art and in stories what is perhaps most valuable is not what can be explained but what can be felt." "This is not a happy book, but it is a rewarding one. The Surrendered grabs your attention-sometimes terrifying you in the process-and doesn't let go until its final moment...Its pages are breathtakingly alive." "[Chang-rae Lee's] largest, most ambitious book." "Extremely well written, powerfully moving in places." "Lee...writes dense and gorgeous prose...Lee shows great tenderness for his [characters], even as he refuses them easy redemption. The final paragraph of his beautiful and tragic novel is as sublime and transcendent as any I can remember. A." "The narrative sweep of the novel turns out to irresistible...a novel so rich in the hearty pleasures of storytelling." "A landmark novel about love and war. 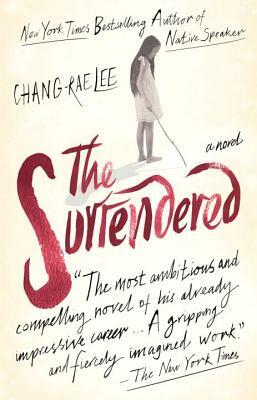 . . Chang-rae Lee's The Surrendered . . . is impossible to put down." "With his signature empathy and artistry, Lee links emotionally complex events. . . . Profoundly committed to authenticity, and in command of a remarkable gift for multidimensional metaphors, Lee dramatizes the guilt and "mystery of survival" in scenes of scalding horror and breathtaking beauty. . . . Lee has created a masterpiece of moral and psychological imagination unsparing in its illumination of the consequences of bloodshed and war." "Beautiful, riveting, piercingly haunting . . . The settings and times are masterfully interwoven to form an elegant, disturbing inquiry into courage, love, loyalty, and mercy. . . . This is a book to read in two or three long sittings, gulping pages, turning them as fast as possible to reach the perfect, inevitable ending." "The odyssey of a Korean War refugee becomes first the subject of, then a haunting overture to, the award-winning Korean-American author's fourth novel. Lee's introspective and interrogatory novels seek the sources of their characters' strengths and weaknesses in their own, and their families' stories- nowhere more powerfully than in this exhaustive chronicle of three hopeful lives tempered in the crucibles of wars and their enduring aftermaths. In a patiently developed and intermittently slowly paced narrative that covers a 30-year span and whose events occur in four countries and on three continents, the entangled histories of three protagonists are revealed. We first encounter 11-year-old June Han, traveling with her twin siblings following the deaths of their parents toward safety with their uncle's family. June's willed stoicism and suppression of fear serve her well in extremity, but they will have a far different effect on her later life-shaped when she is rescued by American G.I. Hector Brennan (himself in flight from the memory of a painful loss). Hector brings June to Sylvie Tanner, a minister's wife who runs an orphanage (and whose own demons owe much to the savagery of history in another place and another time). Each character's past, motivations and future prospects are rigorously and compassionately examined, as the author follows them after the war. In its ineffably quiet way, there really is something Tolstoyan in this searching fiction's determination to understand the characters specifically as members of families and products of other people's influences. The characterizations of Hector and Sylvie are astonishingly rich and complex, and the risk taken in depicting the adult June as the woman readers will hope she would not become is triumphantly vindicated. A major achievement, likely to be remembered as one of this year's best books. "Lee's masterful fourth novel bursts with drama and human anguish as it documents the ravages and indelible effects of war. . . . Powerful, deeply felt, compulsively readable and imbued with moral gravity, the novel does not peter out into easy redemption. It's a harrowing tale: bleak, haunting, often heartbreaking and not to be missed." "A completely engrossing story of great complexity and tragedy. Lee's ability to describe his characters' sufferings, both physical and mental, is extraordinarily vivid; one is left in awe of the human soul's ability to survive the most horrific experiences." In the orphanage, June is a bully to the other children and shows affection only to Sylvie. Yet when we first meet her, she is incredibly caring to her sister and brother. What do you think caused this change in her personality? How did her experiences as a young girl shape the adult she became? Hector seems to develop true feelings for Dora. If things had ended differently in the final scene with Dora, do you think he would still have gone off with June? Why or why not? Do you think his experience with Sylvie colored his relationship with Dora? How? Do you think Sylvie and Tanner would have adopted June had things not happened the way they did turned out differently? Why or why not? June seems fixated on finding Nicholas even after it becomes clear that he is not who he says he is. Why do you think she is so focused? Why do you think she needs to find him? If you’ve read Chang-rae Lee’s work in the past, you know that he writes often of identity. How do these themes play out in The Surrendered? Of Hector, June, and Sylvie, which character do you think has the strongest sense of identity? The weakest? Each character undergoes a traumatic experience that ends up shaping the course of his or her life: Hector’s father’s death, June’s loss of her family, and Sylvie’s experience in Manchuria. How do these events change their characters? Do you think each person’s life would be different had these traumatic events not occurred? The book A Memory of Solferino recurs throughout the novel and is passed from Sylvie to June to Nicholas. What do you think the book means to each character and how does it influence the choices they make? Although The Surrendered is very much about war, the events of the Korean War itself make up a very small part of the book. Why do you think the author chose this approach? What point do you think he was making? How does this relate to his choice of title? Discuss the idea of mercy in the book. Which characters do you think most exemplify this trait? In which scenes does the idea of mercy seem to be the guiding force? Hector is born in the town of Ilion and is named after Hector in the Iliad. Discuss heroism in the book. Are any of the characters heroes? Do they behave heroically?